Any sort of timeline with PRP? I looked through the thread re: Dr Jones and his PRP experiment but didn’t find an answer. Has there been any mention of how long it takes for hair to grow once the procedure/experiment is done? » to grow once the procedure/experiment is done? It peaks between months 4-8 and levels off and begins to wane around month 10 to 12. The current version of PRP will be much more advanced in the coming months and years. As doctors are able to remove certain growth factors that inhibit hair growth, while increasing the ones that stimulate hair growth. Stem cells will be involved as well. Is that the alopecia areata patient? alopecia areata doesn’t count. 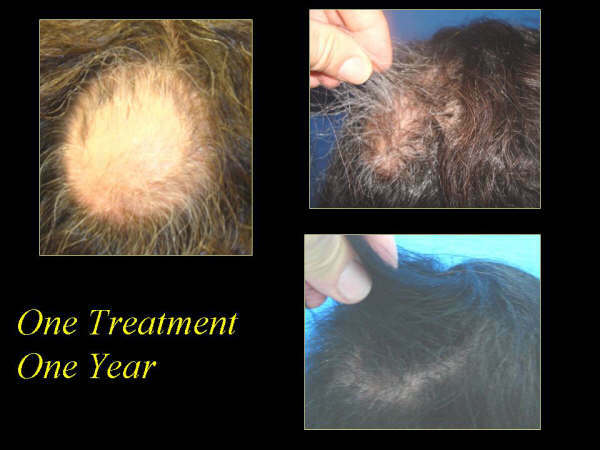 » Is that the alopecia areata patient? alopecia areata doesn’t count. I wish people (furum users as well as doctors) would stop posting misleading photos of alopecia areata which has nothing to do with MPB! sorry guys, did not try and mislead you. i disagree with Areata pics not counting. even though not for AGA they still show it DOES benefit hair in general. actually I thought alopecia areata is more difficult to treat, it’s almost like a death sentence for people with hair loss. I have seen people with AA and not responding to any meds at all. » sorry guys, did not try and mislead you. » still show it DOES benefit hair in general. I’m confident about this new technique, but at the moment is only a theory. I hope the doctors will give us correct and proof images of the results! IF not… it’s another joke like ICX. can you take two so different pictures by accident ? If not, why do they do it ?